Like thousands of your fellow citizens, you want the environment to figure more prominently in the campaign priorities of our political parties, and rightly so! People often forget that environmental issues are human issues, affecting our health, our quality of life, the well-being of our communities, our local economies and our families. That’s precisely why Vire au vert* exists! Summertime, with its street parties, neighbourhood potlucks, picnics and family events (pool party, anyone? ), affords a myriad of opportunities to host events aimed at mobilizing the public around environmental issues in a relaxed but conscientious atmosphere. A mobilization kit* filled with ideas and tools for engaging your candidates. Ask questions on your candidates’ or their parties’ Facebook pages or via Twitter. Together, determine how to reach out to others in your district for support and then get in touch with your candidates. VIRE AU VERT… WHAT EXACTLY IS IT, ANYWAY? 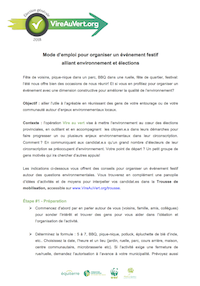 Vire au vert is an innovative coalition of citizens and environmental groups who have set out their environmental demands in a 23-proposal manifesto*. 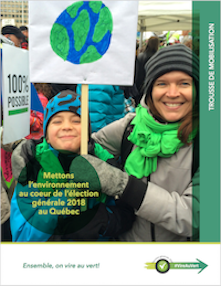 It is also an unprecedented citizen mobilization campaign aimed at putting the environment front and centre in Quebec’s upcoming election. Climate, transportation and development, pesticides and agriculture, biodiversity and forests: are these priorities for you? Join the citizens who are taking action for a greener Quebec!